Posted on 7, April 2016 by EuropaWire PR Editors | This entry was posted in Aviation & Aerospace, Germany, Transportation & Logistics, Travel and tagged A319s, A320s and A321s, A330s, Airbus, TAP Portugal. Bookmark the permalink. 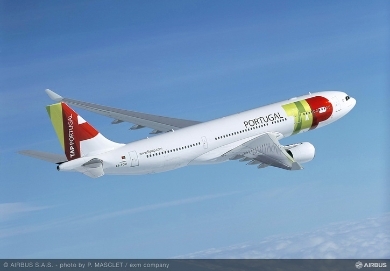 Hamburg, 07-Apr-2016 — /EuropaWire/ — TAP Portugal has signed an agreement with Airbus at Aircraft Interiors Expo (AIX) in Hamburg to upgrade the cabins of its A330s, A319s, A320s and A321s. The engineering and certification of this extensive cabin retrofit programme will be accomplished by Airbus Upgrade Services for seven A330ceo and 41 A320ceo Family aircraft. The retrofit on A330s will include new business class seats with new IFE, while the retrofit on the A320 Family fleet will include new seats. Both aircraft types will sport the airline’s new interior styling. The fleet cabin renewal program is planned to start in the 3rd quarter of 2016 for the A320 Family fleet and in the 1st quarter 2017 for the A330ceo fleet. All the cabin modifications will be completed by the end of 2017, with TAP carrying out the programme in its Maintenance & Engineering facilities. Meanwhile, Airbus will supply Service Bulletins (SBs), perform the engineering design, define and provide the methodology and ensure the overall integration of the retrofit components into the aircraft. The relationship between Airbus and Portugal dates back to 1987 when TAP, then Air Portugal, ordered three Airbus A310s. Today TAP is an all Airbus fleet customer and the largest in Portugal with 61 aircraft currently in service, including 43 from the A320 family and 18 of the widebody family, with two additional A330s to enter service this June to support the expansion of the company’s long haul operations. TAP has also placed orders for the latest generation of A320neo and A330neo Families. Airbus, through “Services by Airbus”, offers end-to-end fleet lifecycle solutions for all its customers. The portfolio ranges from standalone services, to the most complete integrated solutions, including Flight Hour & Tailored Support packages, upgrades, training, e-solutions, engineering & maintenance, flight operations Air Traffic Management, and material management services. Together these enhance aircraft competitiveness by continuously adapting to customers’ evolving needs. With more than 40 years of experience in the aircraft industry and a worldwide network of more than 2,500 professionals, customers benefit from the unique expertise and capabilities from Airbus and its affiliated family companies.